If you are you ready to grow your blog as a new blogger or have thought about starting a blog, you have come to the right place. It’s exciting isn’t it? After 3 years of blogging, I can honestly say I’ve learned so much! One of the most important things I learned was that it’s okay to invest time and money in yourself and your projects. Blogging can be a huge project especially if you’re looking to grow your impact and monetize your site. 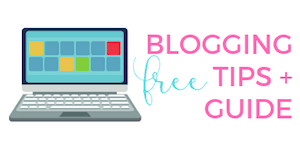 Before we begin, grab all these free workbooks and guides to help with your blog. These are the same guides I used when I got started! Realize that’s it’s also a process and will take time to reach all your goals. If you’re willing to invest in yourself and your blog from the start, you’ll have a much better opportunity to reach all your goals for your blog. I started my blog in January 2015. I've only been blogging for three years and have made over $400,000 online during this time! In 2017, I made over $289,000 online! Blogging has allowed me so much opportunity and has changed my life for the better. As I had no real blogging experience when I got started, I was a complete beginner! 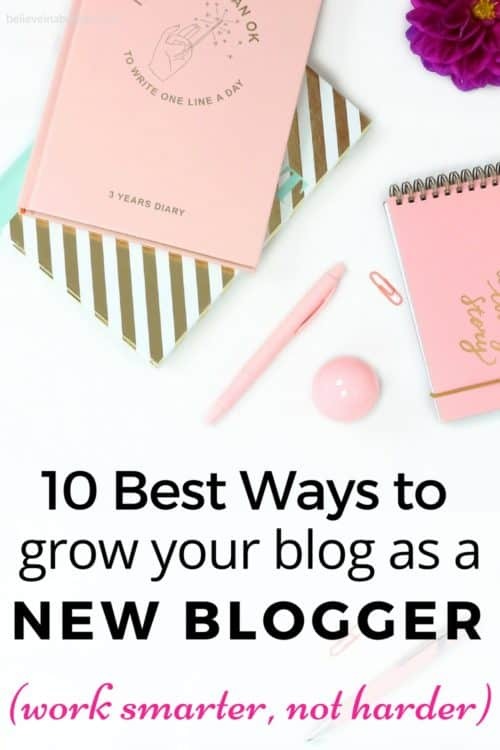 I'm sharing ten of the best ways to grow your blog that have really helped me over the past few years, especially in the beginning stages. If I can do it, so can you! This blog post is to help encourage you to grow your blog – you got this! Here are 10 of the best ways to grow your blog and invest in yourself as a new blogger! If you’ve already created your own self-hosted blog, you don’t need to worry about this but if you’re still getting ready to setup your blog your initial investment should be to purchase quality web hosting. If you’re looking to start a blog that could potentially turn into a business and create multiple streams of income for you, you need a self-hosted website and not a blog on sites like Blogger, WordPress.com, of Wix. The difference is that by choosing a web host, you’ll have your own unique domain name and full control over how you run and monetize your site. Options like Blogger and Wix are free, but they come with limitations and most serious bloggers end up switching and getting a web host any way. To avoid all the hassle associated with moving your blog to its own domain later on, you can just start out with a professional self-hosted blog right from the start. I made $13,000 during my first 6 months of blogging and I wouldn’t have made that money without a self-hosted blog. My #1 tip is to own your blog! This means you need to buy hosting and pick out your custom domain name. This will automatically be one of the best ways to grow your blog because you 100% own your online space! I recommend going with Bluehost because they are affordable and easy to work with. Hosting starts at just $2.95 per month and you get a free domain name for the first year. You can check out my step-by-step tutorial that shows you exactly how to set up your new blog with Bluehost in just 15 minutes or less. This was the very first investment I made in myself as a new blogger. I was able to get hosting and my free domain name for around $100! Three years later, I still use Bluehost to run Believe In A Budget. One of the first things you should focus on when launching your blog is your branding. I know some people recommend having tons of content written and clear focus as your top priorities when you get started. There’s nothing wrong with that, but you need to realize that your blog should and will have its own brand. You want to be clear on who your desired audience is and the look and feel you want your blog to have when visitors come to your site. Your branding may change over time, but it’s important to start out with something fresh and professional to set yourself apart from other blogs build awareness and authority in your niche. First, you’ll need to choose your brand’s colors and design a logo. If you don’t know how to create a logo, you can always hire someone on Fiverr to start you out with something you can use. I used Fiverr to make Believe In A Budget's logo and spent around $6! Get your first Fiverr gig for free here. Next, you want to choose a theme/design for your blog utilizing your brand’s color scheme. You can also work with a designer to help you come up with a blog design or you can download a theme template from sites like a Genesis Theme, Elegant Themes or Restored 316 Designs. When I started this blog, I used the Genesis Theme and a child theme from Restored 316 Designs because I wanted a really feminine theme. While you can select a free theme (there are tons out there! ), they can be difficult to learn as they require a lot of customization. I started with a free theme and completely regret it. I wasted months trying to learn how to code and program my website, simply to save money. Instead, this foolish mistake cost me money. By selecting a paid theme (all of the ones mentioned above), you can set up your theme in only a few minutes. it's very easy to upload into WordPress and takes about 5 minutes! If you don't feel like you have any tech skills, don't stress it. Again, use Fiverr to install and set up your theme. This will cost somewhere between $5-$10 to get your theme installed for you. One mistakes new bloggers make is failing to build their email list early on. You may be intimidated by the idea of starting your own email newsletter or believe your traffic isn’t high enough to get signups, but focus on building your email list anyway. Having an email list can be a great way to connect with readers on a more personal level and market products and services to them when you get ready to do so. One of the biggest mistakes I made was not focusing on my email list. I consider my email list to be the most valuable information that I own! Building a relationship with readers is the best! Not only do I get to write to readers every week via a newsletter, but I get to respond back to readers, help solve their questions and teach them about new things! For this blog, I use ConvertKit. In order to start building your list fast, I’d recommend offering a freebie of some kind to blog visitors in exchange for their email address. The popular term for this is an ‘opt-in’ and I have quite a few to help me grow my list. Think of a common problem or obstacle your ideal audience might be having, then create a solution and include it in your opt-in. For example, if your blog is targeting busy single moms, you may want to create a weekly meal plan with a grocery shopping list that people can download and print out. Think about creating e-books, checklists, resource guides, video training, and worksheets that people can receive for free when they join your list. You can create printable downloads and e-book covers easily in a free program called Canva. Canva is great to use even if you have no experience designing graphics. For example, this is a popular opt-in that I use on my website. 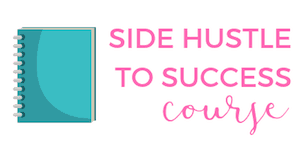 Because so much of my website is geared around helping others side hustle and make money, I offer a free side hustle cheat to my audience. If you are looking to make extra money, simply click on the box below. Then you will learn how an opt-in works and you will receive a freebie! Once you start building your email list, you’ll want to make sure you’re using a good email platform to send messages to your subscribers and to market to them more effectively. Drip and ConvertKit are two of the top email marketing platforms. They allow you to create and customize sign up forms to use on your website, send branded emails out to your list, break up the people on your email list by interest/goal, tag subscribers who click on your links, and more. Drip and ConvertKit also allow you to automate email sequences so you can send new subscribers a series of messages when they sign up. ConvertKit is priced based on how many subscribers you have so when you’re just starting out, you can expect to pay less. Drip has a free version until you reach your first 2,500 email subscribers. Remember, you want more email subscribers and you want a capable email platform that can help you monetize your blog by helping your list convert better. Each email subscriber is worth a certain amount of revenue so the more quality and engaged subscribers you’re able to maintain, the more revenue your blog can bring in. Your email list is usually your most loyal readers, so this is a service you will eventually want to pay for! You’ve probably heard how important Pinterest can be for bloggers. It’s a must-have tool if you want to grow your site’s traffic. Blogging involves a ton of content but it’s also important to heavily promote that content to get more people to your site. If you are unfamiliar with myself and Believe In A Budget, I specialize in Pinterest! I got my start as a Pinterest virtual assistant and have helped over 100+ clients grow their blogs and businesses via Pinterest. Today I've helped thousands of students learn how to use Pinterest, as well as teach others how to start a new career as a Pinterest virtual assistant. Create eye-catching imagery to your blog posts along with Pinterest-friendly images to promote on Pinterest. Create a profile on Pinterest specifically for your blog. Then, be sure to include at least 1-2 Pinterest-friendly images in each blog post. Not familiar with how to create good Pinterest images that get repinned multiple times? I created 9 Pinterest templates that have a proven conversion rate. All you need to do is get my Pinterest templates package and edit the images in Canva to match your branding and blog post title. I also show you how to do this step-by-step when you get the templates and before soon, it will become second nature. Need more help figuring out how to use Pinterest to grow your blog? You'll learn how to take action in as a little as a few hours. Check out my Pinterest shop here. Finally, if you want to really learn how to use Pinterest, you can master Pinterest by signing up for Pinterest Presence. 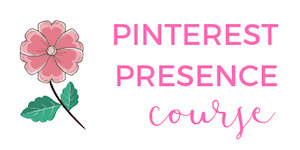 You'll learn every technique and strategy I've used to help myself and others grow their Pinterest marketing skills. Managing a blog can be fun and rewarding, but it’s also a ton of work. The key is to stay organized and plan out your tasks by using a calendar. One of the easiest ways to stay focused and on track with blogging tasks is to use a free program called Asana. Asana is a web and mobile app that allows you to manage projects more efficiently and collaborate with others on projects as well. Most people use Asana to help them manage their team, but if you’re just solo right now as you build your blog, it’s still a very valuable tool. You can use it to assign tasks to yourself with a certain due date, store project notes, and plan your whole weekly, monthly, or annual calendar by setting up recurring tasks. For example, if you put up one blog post weekly and promote it across social media, you can create separate tasks in Asana to remind you to create your blog post, schedule it, and promote it on social media. Using organizational tools like Asana will really help you stay focused and be more productive with blogging. When you create opt-ins to increase email subscribers or even digital products or courses for your blog, you’ll want to offer these items on a nice landing page to help them convert. I use Leadpages for all my landing pages because it’s very user-friendly and comes with a ton of capabilities. With Leadpages, you can use their drag and drop feature to create and edit your own mobile-friendly landing page for a product or freebie that matches your blog’s branding. Here is one of my most popular landing pages! Leadpages also integrates easily with your email marketing platform so you can send emails and capture new email addresses as well. The tools I mentioned above will help you save money by going the DIY route when it comes to creating quality graphics, promoting your blog posts on Pinterest, building your email list, sending out email newsletters and marketing campaigns, and creating landing pages. It’s simple to set these features up to grow your blog and your blog revenue once you get the hang of it. However, when it comes to the maintenance and upkeep of your site, you may want to consider investing in some technical help to save you more time if that’s not your forte. Running your blog on WordPress is one of the best options out there but you still need to update your plugins, make sure your blog is secure, and make tweaks to your design and branding every now and then. If you don’t want to bother doing these things yourself and would rather just write and promote your content, consider hiring a technical expert instead for a flat rate, hourly fee, or monthly retainer. If you’re going to run your blog like a business, you’ll most likely need some expert training sooner or later. This is why you should consider investing in a digital course or self-help book to help you improve and grow your blog. After taking EBA, my pageviews increased ten fold and I started earning back my investment by generating more blog income. Enrollment for the course only opens once a year; so in the mean time, you can grab this FREEBIE that gives you over 120+ blogging ideas to help you start writing blog posts! The course creator, Ruth Soukup, has also created books with great tips for new bloggers like How to Blog For Profit Without Selling Your Soul. Once you feel confident with your blogging skills, you should consider honing in on an area of your blog at a time to help you get even better results. Pinterest is the BEST way to quickly grow your blog and get traffic. Tailwind, a Pinterest scheduling tool, is the best way to help you do this. If you haven't already, try Tailwind out for free. In my course Pinterest Presence, I teach you everything you need to know about how to use Tailwind. Utilizing Tailwind Tribes (part of Tailwind) is also one of the fastest way to market yourself and grow your blogging audience. Click here to start using Tailwind for free. Next, I would sign up for Making Sense of Affiliate Marketing. Michelle, the course creator, teaches you how to monetize your blog through affiliate marketing. She regularly makes over $100,000 per month blogging, so she knows what's she talking about! Learn about Making Sense of Affiliate Marketing here. Now, give yourself time to take each course and implement the material. By no means do you need to read a book or take a course, especially if you are on a budget. But if you want to treat your blog like a business and earn an income, you need to remember to invest in yourself. Paying to learn from an expert will teach you how to do things right the first time and save you time in the long run. Finally, one of the most important ways you can invest in yourself as a blogger is to make a time commitment. Blogging success doesn’t happen overnight, and it takes a lot of time, planning, dedication, and strategy to reach your goals. You’ll have to prioritize your blog by setting aside time to write each week, create graphics, promote your posts, create cool resources and products, as well as interact with your audience. The tools mentioned above will certainly help you save some time in the long run, but it’s important to determine how much time you want to dedicate to blogging and commit to it in order to start gaining some traction. When you blog about something you’re passionate about and focus on impacting others, it becomes easier to dedicate your time and enjoy to something you actually enjoy doing. These are some of the best ways to grow your blog. If you are a new blogger, what are you focusing on right now? You provide great tips + different techniques to improving your blogging strategy and ways to boost traffic. I heard so many great things about ConvertKit and am going to sign up today! Will be working on creating a landing page with solutions that I know my readers are looking for. I have already created several freebies so ConvertKit and the landing pages will be a great add on to my strategy. Thank you! I have been thinking of investing in EBA, just a little bit on the expensive side right now. But, I am on their list and hopefully, when it opens up next year, I will enrol. I haven’t used Asana, but I do use Trello and works great. It is very visual (somewhat similar to Pinterest) and I love it. That’s true, I have been doing that already. Saving up a little bit to be able to enroll in EBA by next year. Thank you so much, Kristin. I love your blog! Great tips! This post is very helpful and encouraging. Wow, you completed EBA in 12 weeks! I just completed Unit 2. It took me about 3.5 weeks. My goals are to continue to learn from EBA, write more blog posts, and enroll in your Pinterest Present course. I finally have 20+ blog posts. Yay! Now, I am ready to get myself out there. Thanks for being an inspiration to many! Yes! I was on a mission with EBA 🙂 I printed out every lesson and made a binder and went through everything like I was taking a college course! Good luck!! Great list! Do you like Drip better than Mailchimp for a free platform for beginner bloggers? I don’t know much about Drip – going to look into it now. So I started with Mailchimp because it was free – and totally regret it. Because it was free and geared around beginners, it wasn’t as helpful as a platform as ConvertKit, Drip or even Mailerlite. If I were to spend money on my blog, outside of hosting, I would buy a theme and pay for an email provider! It’s amazing what you can do with a stronger platform – more signups, stronger readers, opt-ins, etc. ! Woohoo!! The work load never ends, right?! Great info. I really enjoyed it. Definitely will use a lot of the material provided. Keep up with your good work and good luck for continuing growing your success. I love the tips. I JUST started my blog and am having fun. Once I get a schedule down I want to go for making money at it.